Hillary takes on Bernie’s worldview at the PBS debate. Clinton was clear, full-throated, and tried out a new critique on Sanders that just might work. 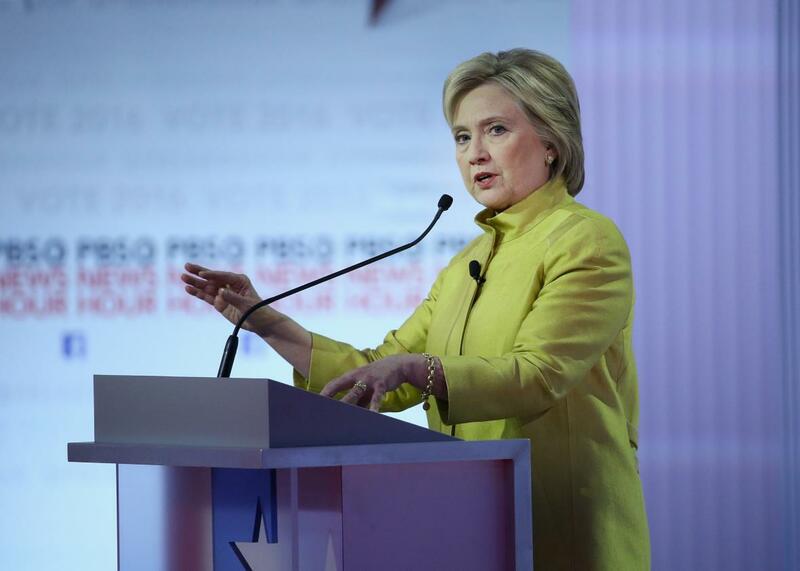 Hillary Clinton participates in the PBS debate on Thursday in Milwaukee. Unlike so much of her rhetoric, which hedges and qualifies and tries to place policies in context, this was clear and full-throated. It matches Bernie Sanders’ intensity without mimicking his message, and more importantly for Clinton and her backers, it stands as an anti-Sanders argument that could actually work. For the past month, Clinton has struggled to find a message against Sanders that doesn’t alienate his backers or estrange her from the Democratic left. She tried to hit him on single-payer health insurance, calling it an attack on the Affordable Care Act. That failed. She tried to question his integrity on campaign donations. That failed. She slammed him as conservative on guns. That failed. Now, she says he’s a weak ally of President Obama. It’s still early, but if the pattern holds, that will fail too. The other choice, when you can’t stop a rival, is to co-opt him. But there, Clinton is limited by her disposition and experience. She’s an incrementalist with the “battle scars” from fights over health care and other Democratic priorities. And she spent the formative years of her political career at the center of national politics at the same time that Democrats were facing a powerful and advancing conservative movement. The result is that she’s risk-averse, inclined to fight for small gains instead of big accomplishments. For incrementalists, there are no moral victories in politics, and you don’t gain anything by losing big. You just lose energy and allies. That’s probably why Clinton won’t take the obvious route and endorse the “public option” in health care reform. Doing so would blunt Sanders’ rhetoric on “Medicare for all” and show voters how Clinton would get to universal health coverage from the Affordable Care Act. But barring a Democratic Congress, the public option is dead on arrival. And Clinton isn’t going to endorse something that doesn’t have a chance. Here, in her closing statement, is the alternative to imitating Bernie or tweaking him on specifics, the latter of which she did for most of this debate. Rather than contest Sanders on policy or fealty to the Democratic mainstream, she directly addressed his worldview—not with an attack, but with a critique. Yes, she says, she agrees that there’s too much money in politics and that Wall Street should be punished and controlled. But she also sees beyond these problems to other ills, and she believes they have to be addressed on their own terms. Clinton doesn’t attack Sanders in those lines, but she’s not subtle either. She paints the Vermont senator as too blinded by his focus to see or understand the unique problems faced by different minority and underprivileged groups, as evidenced by his clear discomfort with topics outside of income inequality. (You could call what Clinton is doing an “intersectional critique,” though her advisers would probably not use that term.). She zeroes in on Sanders’ great strength—his incredible consistency—and makes it a liability. Whether this works is an open question. Clinton has her own, deep-seated problems that threaten her ability to win, from her history with Wall Street to her judgment on foreign policy to her ties to the worst policymaking of the Bill Clinton administration. But, after weeks of floundering against Sanders, there’s a real chance she’s found her footing. Which is to say that Hillary Clinton is visibly improving in the face of a vigorous challenge. If she wins the nomination, and captures the White House, there’s a good chance she’ll have Sanders to thank for making her fight for a win, instead of walking to the finish line.